When I see the beauty of New York City, the people cheering all along the way and the festive atmosphere within the crowd of runner, I wish one day I’ll write another post from the runners’ side -people are allowed to have dreams, right? More than a race, the New York City Marathon is an institution. It all started in 1970 with just a few runners, to become the largest marathon in the world. Every year, it brings together 50 000 athletes from all parts of the world, plus as many people on the supporters' side. We wanted to experience the Autumn in New York, so we chose dates that would allow us to enjoy both Halloween and the New York City Marathon. Wise, wise decision: cheering on runners in this unique atmosphere was one of the highlights of our trip! How to participate to the New York City Marathon [as a supporter] ? The New York City Marathon goes from Staten Island to Central Park, going through some of the most beautiful places in the city. Although you can't just hope to walk in the city and see the race by chance -New York is a big city. There are plenty of recommended spots to watch and cheer on the runners. Bronx 138th St - 20th mile, the worst part for runners: the wall. They need you here more than anywhere else! Central Park South - 25th mile, very crowded, amazing atmosphere, stunning views on the park -a must! We arrived in Lafayette Avenue around 9am, thinking we would be way too late and would struggle to see something. It was actually still quiet, and we arrived just in time to see the disabled runners. Good thing we took a takeaway cup of coffee on the way -even with the beautiful weather, it was pretty cold. After the athletes with disabilities and their volunteer guides arrived the feminine runners -the pros. It is unbelievable -they are so fit, so fast, so strong! Supporters are screaming, cheering, singing even. On the other side of the street, a group plays the best of the Rolling Stones -talking about a motivation!! After the pro runners come a few cars and motorcycles, then the second group of runners finally show up. They are so many, it's insane. Inside the crowd reign such an exciting atmosphere! A woman stops running to make some acrobatics. A man juggles while running. Another one is dancing. We see Spiderman, Wonder woman, lots and lots of super heroes. It's fun to see the evolution from the first runners to the rest of the crowds. It goes from top models in the pro runners -seriously: how can you look so perfect after 8 miles running? I'd have a pink/red face, messy hair and I'm not sure I'd still be able to smile. They are MY super heroes!- to... actual super hero costumes. And fairies. Princesses. And even a group of Pikachus! We planned (in our over-organized/crazy travel schedule) to stay only an hour. Three hours later, we realized times fly when you're having fun watching the New York City Marathon! Imagine a non-stop crowd of runners in the middle of Brooklyn, with “Empire State of Mind“ resonating in the streets. For us, supporters, it’s more a party than a race. Runners are so many you can spend the day following them, going from a point to another on the map, to end up in Central Park. That said, I guess you'd better arrive early in Central Park if you want a good spot. It's so great everybody wants to be there. After the race, the party goes on all day in New York. Proud finishers are everywhere, wearing their awesome medal -in the streets, the subway, the bars, even the airport. Be aware, runners, if you come to support the New York City Marathon, you might come back home with a new dream -and good luck with that! 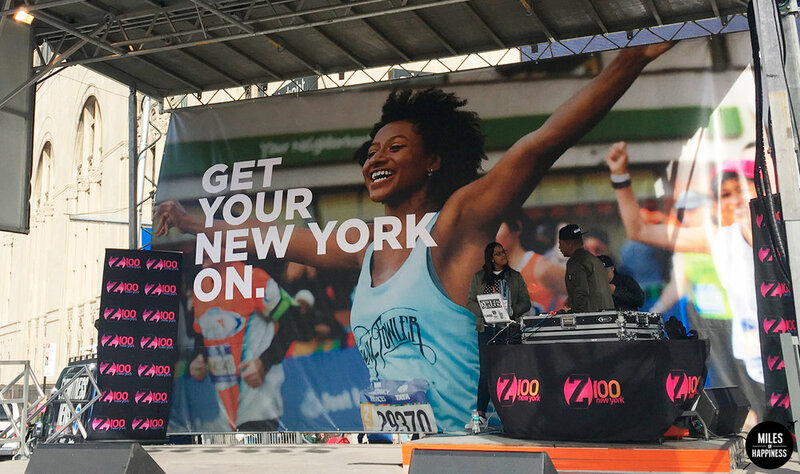 How to participate to the New York City Marathon [as a runner] ? The NYC marathon is one of the most famous in the world. Therefore it’s obvious it won’t be easy to sign up -unless you’re a pro (in that case: you’re my hero). But you know, as Walt Disney said, “It’s kind of fun to do the impossible“. So LET'S!! You ran the NYC marathon? You're a hero! Please please pleaaase tell us about your experience in the comments, we’d be so thrilled to read how it is “from the other side“!